Things are bad right now, but they don’t have to stay that way. The Spurs defense so far has been, at best, suspect. To be fair, Minnesota and Portland were above average offenses last year. The Wolves had the 4th highest offensive rating in the league, and the Blazers were 13th. Both were expected to continue that this year (assuming the Wolves hang onto Jimmy Butler), so their offensive outbursts, against both the Spurs and their other opponents, aren’t completely unexpected. Indiana should be able to at least maintain the league average offense they put up last year and the Lakers, with the addition of LeBron James, are already better than that. Still, a defensive rating of 122.7, by far the highest in the league, is cause for concern. The obvious explanation is the loss of the team’s three best perimeter defenders from last year in Danny Green, Dejounte Murray, and Kyle Anderson, and the two best potential perimeter defenders who will be available to play this year, in Derrick White and Lonnie Walker IV. But that doesn’t mean the defense has to be this bad. In fact, if we look at last year, with none of those players on the floor, the team gave up 1307 points on 1154 possessions, which is a defensive rating of 113. That would have been last in the league, by a lot, but it would also be much better than what the team has put together so far this season and would move them up from 30th to 22nd. Of course, scoring is up so far this year. The average defensive rating for all teams is a little over 1 point per 100 possessions higher than last season. Still, if the Spurs can maintain their current offensive efficiency (a big if), even a defensive rating of 114 would give them a net rating of +.8. That generally works out to about 43 wins, which won’t be good enough for the playoffs, but is pretty good for a team this deep into it’s point guard depth chart. Getting there doesn’t require changing personnel, or waiting for White/Walker to get healthy. The team doesn’t need to trade for George Hill, even if that would be nice present for the fans. They just need to be disciplined and execute the scheme. So far, the team has struggled to do that in all kinds of easy-to-fix ways. There’s a reason the Spurs emphasize defensive drills and accountability in every training camp. So far, it doesn’t appear to have made much of a dent, though. On the Spurs very first defensive possession of the year, Rudy Gay is caught watching the ball handler and loses his man, Andrew Wiggins, who catches and shoots a wide open three from the top of the key. Patty leaves Seth Curry wide open in the corner to step in front of Pau Gasol and pick up Nik Stauskas. Stauskas makes the easy pass to Curry, who drills the three. Patty’s gamble leaves Lonzo Ball a wide-open three with no potential for a positive return. Patty wasn’t going to get a steal here, and wouldn’t have been able to contest if LeBron had chosen to shoot. If he’s going to gamble, he needs to be a step higher to at least threaten the passing lane. Another Patty gamble gives Cory Joseph an opportunity to cut behind the defense. Worse, once Joseph kicks the ball out to Tyreke Evans on the left wing, Patty doesn’t pursue Joseph out to the left corner. Evans makes the simple pass, and Joseph nails the wide-open look. Even on otherwise solid defensive possessions, players will read the play differently, or fail to read the play at all. The Wolves are running this play intentionally to get a backcut on DeMar. Both bigs clear out to the top of the key, so there’s no rim protection, Jeff Teague circles through the lane to the opposite corner, and Derrick Rose pretty much just stands there. That is, until he sees Andrew Wiggins cut and starts walking back up the court before Wiggins even has the ball. It’s hard to tell in the video who’s communicating with DeMar and what, if anything, they’re saying about the situation, but it’s clear DeMar doesn’t realize he has no help at the rim. He should be able to see Pau just to his left and LaMarcus at the top of the key so there’s no reason to over commit and risk exactly what happened. Davis Bertans sees that DeMar DeRozan is getting double-screened, so he switches from Anthony Tolliver onto Derrick Rose. DeMar gets through both screens, sees Davis following and pointing at Rose, signaling that Davis has Rose now, but doesn’t recognize the switch right away. He actually tries to slide over the top of Davis before realizing he should be out on Tolliver. This is 2018 Derrick Rose we’re talking about, so Davis probably doesn’t need to switch. He could easily just bump Rose on the way through the lane to buy DeMar some time, then get back to Tolliver. Still, DeMar’s late recognition of the switch leads to him being late to Tolliver’s screen on Bryn Forbes and gives Tyus Jones an open lane to the rim. Jones throws the ball away, though, so the Spurs got away with this one. C.J. McCollum beats Patty Mills off the dribble, but the real problem here is no help. DeMar comes off his man one pass away, which is rarely the right answer, but if he’s going to leave his man, he needs to actually stop penetration. Instead, he has little impact on C.J.’s drive, and lets Maurice Harkless get inside position for a potential offensive rebound. On the other side of the floor, help responsibility here probably lies with Rudy Gay on Al-Farouq Aminu in the corner, but he’s way too late to make a difference. Both Patty and DeMar follow Josh Hart into the post and leave Lonzo open for another 3. In a similar situation, Jakob Poeltl follows LaMarcus and Darren Collison across the lane instead of staying with Thaddeus Young. Thad can’t get a handle on the bounce pass, but he was wide open for a dunk in a half-court set, something that should basically never happen. That’s just a sample of the defensive breakdowns the team has suffered from so far. Every player on the roster who’s gotten minutes has been involved in a simple mistake that led straight to points for the other team. By my count, they’re giving up about 18 points per game on those mistakes. No team is perfect, but trading even half of those gimme buckets for decent contests would be a huge improvement for the defense. 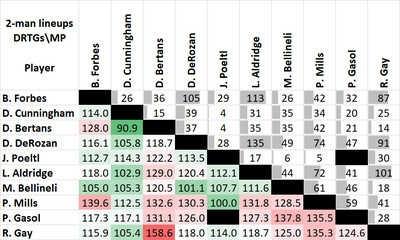 Surprisingly, Marco Belinelli and Bryn don’t make many appearances in these defensive breakdowns. Both have athletic limitations, Marco more so than Bryn, that prevent them from being great defenders, especially in transition. So far this year, though, they’ve mostly been where they’re supposed to be, when they’re supposed to be there. They’re unable to contest effectively in many cases, but they aren’t typically giving away free points with mental errors. That’s obviously not a recipe for a lock-down defensive team, but better communication and awareness would go a long way towards shoring up some of the gaps. That’s not the only option they have for improving though. Looking at 2-man lineup data, there appear to be some simple lineup adjustments the team can make to help with that goal. Here’s the data in a single table, with minutes played together in the upper right, and defensive rating for the two players in that time span in the lower left (as of 25 October 18). Yes, the sample size is very small, but when your defense is 5.1 points per 100 possessions worse than the 29th placed team, it’s time to take some chances. First, Patty and DeMar shouldn’t play together, ever. The team has a defensive rating of 130.3 in 74 minutes with both of them on the court. But, in the 77 minutes DeMar has played without Patty, it drops to a 103.7. That’s obviously difficult to do with such a short guard rotation, but DeMar doesn’t have a defensive drop-off like that with any other player on the roster. When Patty plays, he should be paired with Dante Cunningham. Dante is the only Spur who has an above average defensive rating in every pairing, meaning he needs more playing time, anyway. Pau should probably have the same restriction. LaMarcus can’t play all 48 minutes, so to make that work, Jakob Poeltl needs to cut down on the simple mistakes that get him pulled from the game. The team could, and should, give Chimezie Metu some run. He’s raw, and bound to make many of the same mistakes that Jakob makes, but brings a level of energy and athleticism that no other big on the roster can match. Finally, Marco needs to play more minutes alongside DeMar and LaMarcus. That 3-man lineup is +24 in 35 minutes, easily the best 3-man lineup the Spurs have at the moment. That probably means that Patty and Bryn don’t share the floor anymore either, which is a good thing, because they’re the worst defensive 2-man lineup on the team, with a defensive rating of 139.6 in 42 minutes. The return of Derrick White will make all this much easier. Not only will he be a better defender than any of the other guards who aren’t injured, but he’ll also make it easier for Pop to stagger the minutes of the least effective defenders on the team. If Lonnie is able to snag some minutes when he returns, that will help as well. It’s possible the team’s guard rotation could still turn out to be a strength in the long run, but getting there is a going to be a bumpy road. 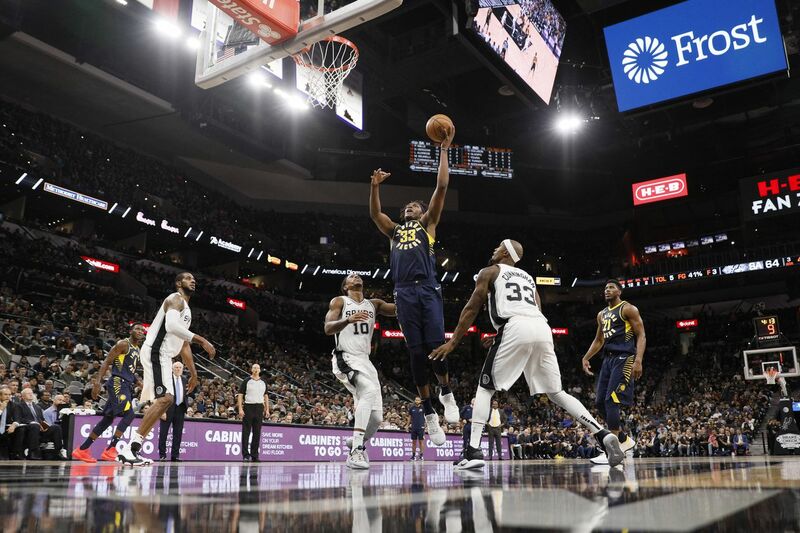 Still, regardless of who plays, until the Spurs find their way back to the discipline and execution that has long been a hallmark of their defense, they will continue to struggle on that end.